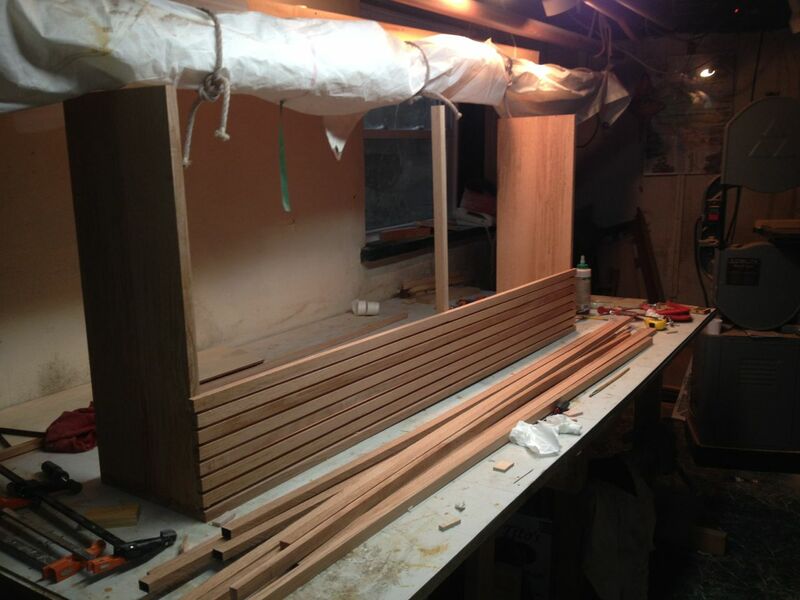 I sometimes wonder if Helena doesn't indulge my odd obsession with boat building for her own deep purposes... namely, getting things built for the house, which is her own obsession. She's been asking for a radiator cover for her piano studio for some time now, so I decided a nice one would be the ideal Christmas gift. I came up with what I thought was a simple design -- much simpler than the typical one with routed cut outs and decorative tin grills. The design, as illustrated below, is deceptively simple: a top, two side panels, a center support strut, and lots and lots of strips down the front. The wood is red oak, which I bought rough-cut from a new local place that is half custom cabinet place, and half hard wood seller. They have a good selection of hardwoods including some 'vertical grain' red oak that I thought would be good for the job. I reasoned that vertical grain would help keep the cabinet from warping when subject to the heat and moisture generated by the steam radiator. I have NO idea how right I am about that, but time will tell. This design requires a lot of strips, and to look right, they all need to be the same size, and they all need to be straight. After planing the wood down to the right thickness ('right' meaning what looked right to me), I first tried ripping out the strips with my table saw on the work bench. But that was clearly too difficult and downright dangerous, and I had to stop for a couple days to rig up an out feed table and sturdy stand. 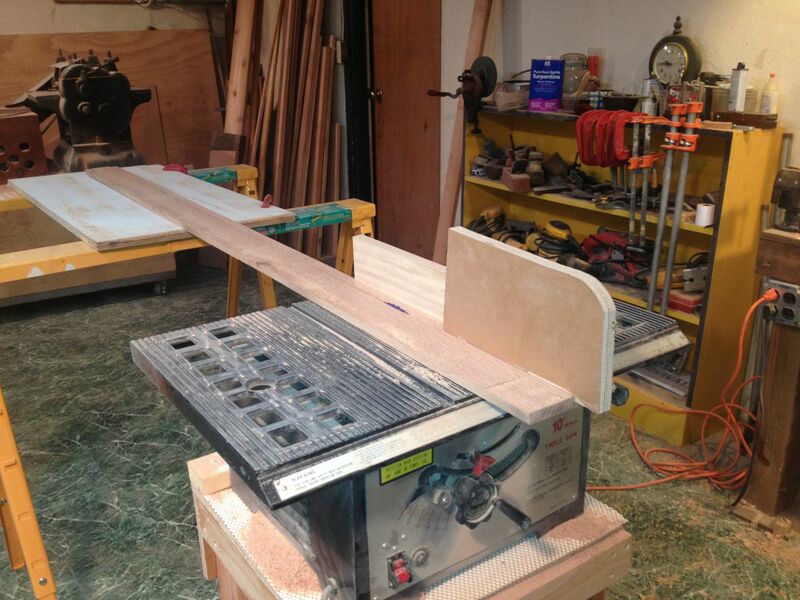 That, plus a tall, L-shaped push board (see below), made it possible and safe to cut out the many, many strips. The push board might seem excessively big to some, but the long shape keeps the strips under control during the crucial last few inches. The height keeps my hand far above the deadly blade. Do you sense that table saws make me nervous? 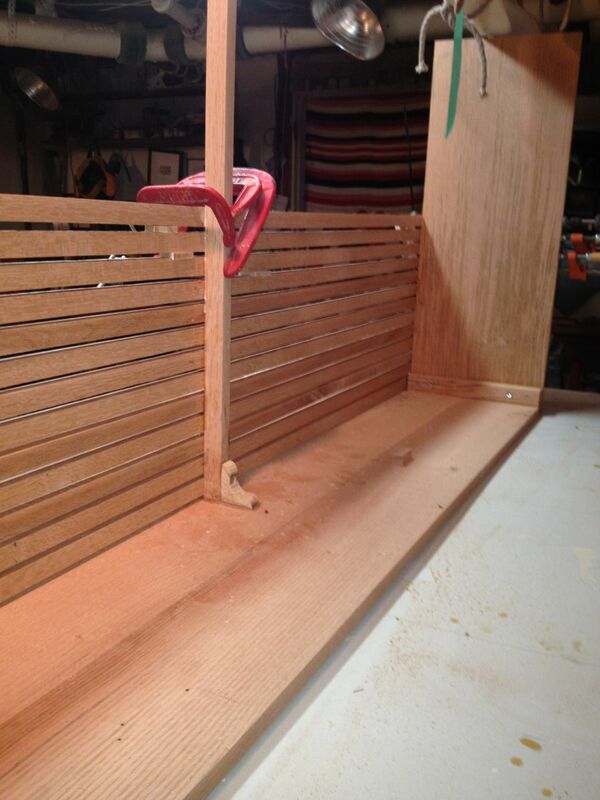 For the center support, I cut a miniature boat-builder's knee to fasten the strut to the top of the cover. With two screws and a few dabs of Titebond III, it was very firmly attached. Speaking of the glue, I chose Titebond III because I've been using it a lot for boat projects (interior), and because I reasoned its water resistant properties would help it hold in the hot, moist environment. 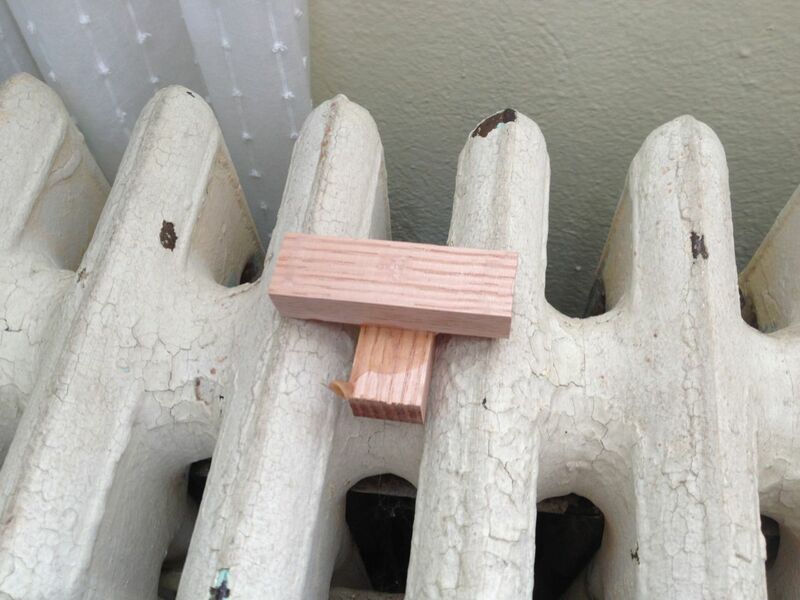 I was a bit worried about the heat, so I glued up a couple test joints and did everything I could think of to test the bond with all the heat the radiator could generate. I'm sure I got the joint much hotter than it will actually get. The glue didn't show any signs of softening, so I'm sure it will do the job. Is I always say, there's no need to wonder if something will work when you can test it. That's science, baby! The photo above also shows how wide the top and sides are. I could not get planks that wide, so I had to joint two narrow boards into one wide board. That was a very interesting project in itself, that I'll discuss next time. I do, 4 of them to be exact. I expected it would be a radiator cover that could be taken off and sailed. Sure would save boat storing. It would be a darn big radiator cover, though. I saw the knee and my immediate reaction was two fold; first, that's cool. Second was, why didn't he just dado that into the top piece? It could then be covered with one of the strips on the front. Just thinking out loud, so to speak. I used the knee because I wanted the middle strut to line up, vertically with the two sides, and I thought the knee would lend more support. Also, it was the first thing I thought of!